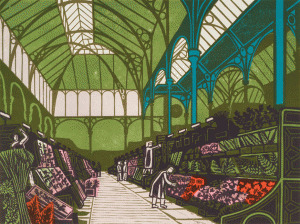 Edward Bawden was an English printmaker, graphic designer, illustrator and painter. He studied at the School of Art in Cambridge (1918–22) and at the Design School of the Royal College of Art (1922–6), where he was a contemporary of Eric Ravilious and was taught by Paul Nash. After graduating he worked on a large variety of projects for the Curwen Press at Plaistow, London, and subsequently for many other publishers, producing book illustrations and cover designs, posters and advertisements, leaflets and calendars, including commissions for Shell-Mex, Westminster Bank and the London Transport Board. He held his first one-man show, mainly of landscapes showing the influence of Nash, at the Zwemmer Gallery in London in 1933 and later during World War II served as an Official War Artist in the British Army. His later work, particularly as a graphic designer, was known for its simplicity of line and wit, but he also returned to large-scale mural painting, including murals for the Lion and Unicorn Pavilion at the Festival of Britain, London from 1950 to 51.